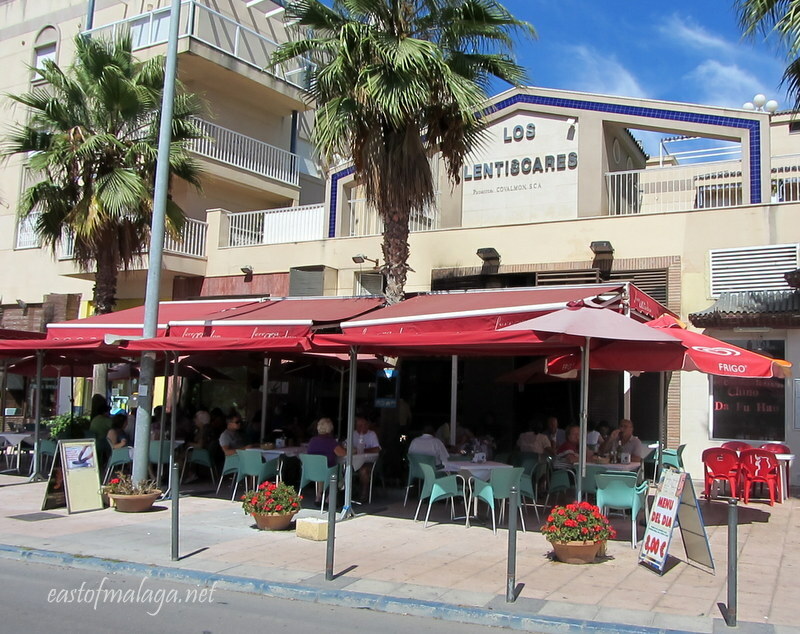 For much less than the cost of an evening dinner, most restaurants in La Axarquía have a cheap, fixed-price meal available at lunchtime only. Because the normal Spanish working day has a 3 hour break in the middle, many Spanish workers take advantage of this time (often referred to as a siesta) by catching up with friends or colleagues over lunch. Why eat a sandwich at your desk when you can enjoy a leisurely lunch with friends? Known as “Menu del Día“, you can usually enjoy a two or three course meal, including bread and your first drink, for around 8 – 10 euros. It´s usually a set menu, though there is often a choice of three or four dishes for each course. A typical menu might include soup or salad to start, followed by fish or pork with flan or coffee to finish. Bread, plus your choice of first drink (beer, wine or water) are usually included in the price. Look out for a board outside the restaurant, advertising the Menu del Día, which will usually be written in Spanish, and always remember to look out for restaurants and bars frequented by locals rather than tourists. ** Ferrara Asador on the N340, near to the Repsol garage. At only €8 with great service, good choice and quality of food, it´s well worth a visit, but go before 2.00pm as it gets very busy, especially in August. ** Fancy something a bit different ? Try the Jing Chinese restaurant on the Paseo Maritimo along Ferrara Beach. Their menu del día is even cheaper at €6, but drinks cost extra. Again, excellent food and service. Where´s your favourite place to eat, east of Málaga? This entry was tagged Andalucía, cost of living, culture, customs, East of Malaga, Europe, Food, life, lifestyle, Malaga, recipes, Spain, Spanish bars, Tapas, Torrox, Travel theme. Bookmark the permalink. Oh, those fries look sublime. What I wouldn’t give for some right now! Those fries are definitely the best in the whole of Spain – of that I’m sure! 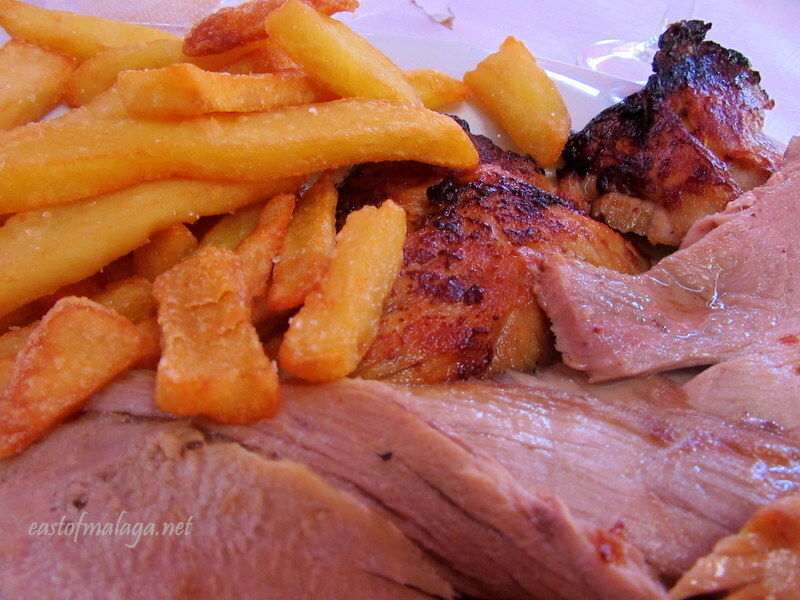 This roast pork has made me drool and it is only noon :S. You sure know how to capture food!!! Thanks for that, Paula – it’s really kind of you to say so. Delicious! I am into great food on a budget. These days, many of us have to search out good food on a budget, and the Menu del Día in Spain really hits the spot! I love a post on food and photo 3 looks like real chips!!! …and they tasted like real chips, too! Actually now I think of it, this restaurant has the best chips that I have tasted in Spain! YAAY! Yummy!!!! I feel like I’ve just been in Spain for a siesta, thanks to your wonderful photos and description. Thank you! Hey Marianne, did you know there is a Facebook page called Axarquia, All about food? I’ve never eaten out east of Malaga, we tend to stick to the city or the touristy Costa del Sol (because I really like places that are hoppin’). We don’t eat out much, 2 kids with very large stomachs can get pretty pricey! The two restaurants I have mentioned in this article get pretty busy – in fact, the one with the red blinds (in the photo) which is Ferrara Asador often has people standing around waiting for a table! But then it IS good food. I know what you mean though, Serena, it´s mostly adults that enjoy a menu of the day. Mouthwatering! I’m drooling over here! I like the idea of having a delicious, leisurely lunch with friends and sit outdoors in the sunshine – just wonderful! You’re right – it IS wonderful! One of my favorite places is the Axarquia Petrol Station at the Nerja Frigiliana exit of the motorway. Great menu del dia for 8.60€ including your first drink. Really good food and great service. Actually, you are not the first to mention that this (relatively) new petrol station has great food. I´ve not sampled it myself – yet, but I´ve no excuse not to now! What a civilized concept: a three hour lunch break. I am the queen of the sandwich at my desk. How lovely it would be to take a leisurely lunch. Yes, very civilized – but the sting in the tail is the return to work later in the afternoon! I´m sure the siesta came about to escape the heat of the midday sun, with a return to work as the day cools down. What a great way for good class restaurants showcase their menus though! I´m sure that they get lots of repeat business as a result! It is one of the first things I noticed when in Europe is how different lunch is viewed. Here, it is almost a burden and many skip lunch or eat “something” at their desk. In much of the Europe I visited, lunch was so much more than a meal — and so much more enjoyable. When I was in Spain, I knew enough to seek out locals-approved restaurants, especially for lunch, so, I’m no stranger to “Menú del Día”. What a treat! Luckily for me I don´t have to do that! That is a lot chaper than our set menus at over 15euros and they look so tasty! We took a trip up to Toledo, in central Spain, a few weeks ago and the prices up there were considerably more than here, too. Most places were 13-16 euros for what we can get here for almost half of that! 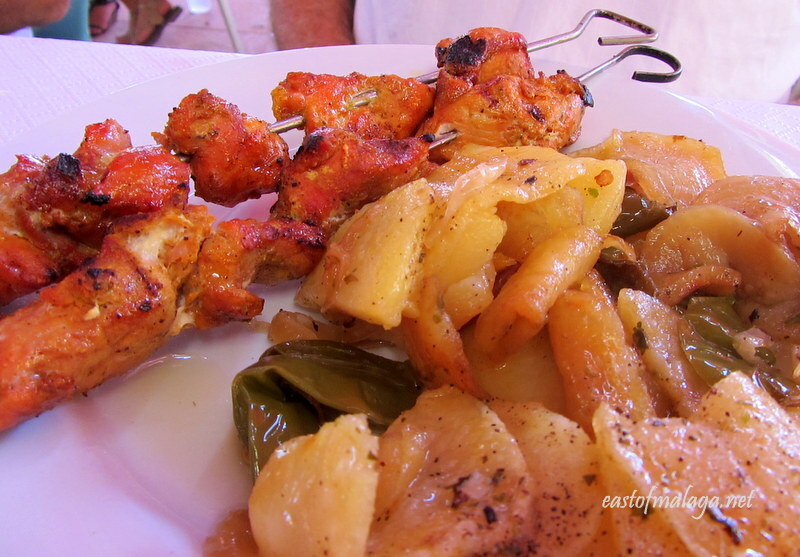 You are lucky…don’t eat out much because of that…we do have a curry night for EUR10 so I must definitely try that!! Mmmm… curry night sounds delish! Would that be somewhere near the Cajamar bank, by the front entrance of Atarazanas market? Cruz Campo. My fav when in Espana. Great post. I’m starving. Can you pass me a virtual pinchitos, pro favor? Virtual pinchito on its way, and I´ll throw in a CruzCampo too! Your beautiful photos reminded me of Buenos Airies! 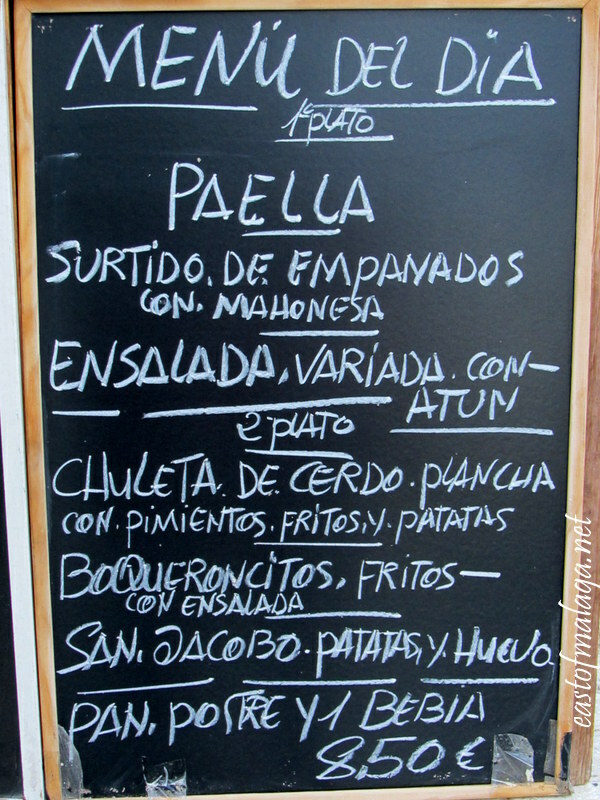 We ate at several restaurants that had ‘Menu del Dia’ specials that were great value! One of the few good things done by Franco…cheap food for the workers. A great tradition and we are lucky that locally we do still have a few restaurants that serve a good Menu! I think at one time it was the law that restaurants had to offer a cheaper fixed price set menu for workers. Don´t think it´s the law these days, but I´m glad most restaurants still carry on the tradition. You´re right – now it´s tradition rather than law – but a good one! Great pics and information! 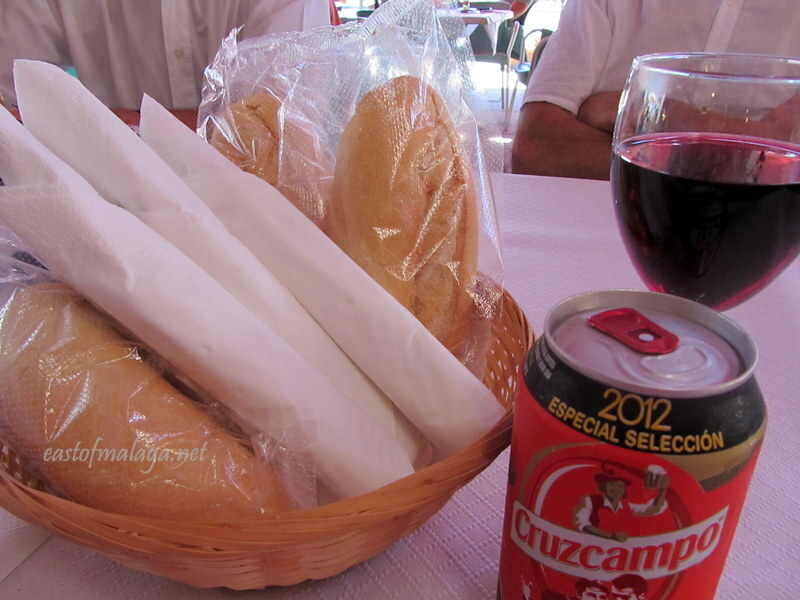 We have taken advantage on several occasions of the Menu del Dia on our many trips out there. Just curious though – when does this Menu usually get served – is it ever available during the evening too? Mostly the Menu del Día is available (around here) between around 1pm and 4pm (ish) each afternoon, Monday to Friday, though you might find an odd restaurant which extends the hours into the evening time. Many Chinese restaurants have their Menu del Día available all day, but outside the lunchtime trade you might pay a Euro or two more. I’m a huge fan of menu del día, both in Spain and Portugal. In some places, you still get a whole bottle of wine (for two people) included in the price, making it incredible value. I’d hate to have to go to work afterwards though! When I lived in Barcelona, my friend and I didn’t work on Fridays so we used to try out the menu del días of restaurants we could never afford to go to normally. Yes, that´s right! I´m a huge fan of the menu del día, too.